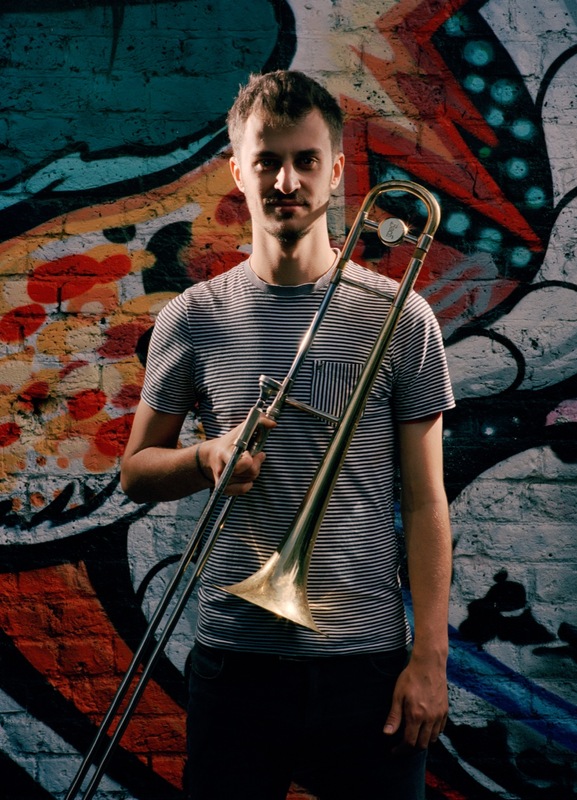 Composer, trombonist and band leader RAPH CLARKSON has a fascinating story to tell, a story which draws on his family history and, in a new album, presents a complex self-portrait – expressing, as he says, “what makes me me”. Raph spoke to Peter Bacon. LondonJazz News: The new album from your band The Dissolute Society, Soldiering On, is very much centred on people. At so many levels. Tell me first about your family and its place in the album. Raph Clarkson: I, like my parents, was born and bred in London – go further back however, to the generation of my grandparents, and one encounters a fascinating picture of pre- and post- WW2 European migration. My maternal grandparents were both German Jews (one was half-Italian) – my grandmother escaped north Germany, travelling to Palestine by boat in 1934 aged only 10; and my grandfather left his hometown of Breslau (now Wrocław, Poland) to live with his Italian mother in Florence; his jewish surname Köhn (Cohen) was disguised by combining it with his mother's Berti, to form Comberti. The two met in London in 1948. My mother, Micaela Comberti, became a baroque violinist and a key member of the so-called early music revival in the 1970s. Her untimely death at the age of 50, in 2003, was the most significant moment of my childhood – I was 15 – and I suppose it was inevitable that I would go on to explore my grief, and my understanding of my mother and the generations before her, in my creative endeavours as an adult. I think after many years of trying to work out what I wanted to do creatively as a musician/artist, I realised that expressing what makes me me made the most sense – that is, it just felt like the right path to take – it was and is the most authentic thing I could/can offer. So, an exploration of my family, and my experience of knowing my grandmother and of bereavement especially, sparked the words and music that you hear in the first third or so of the album. LJN: And the “elders” who inspire your music? RC: The album has a two-fold dedication; to my mother, but also to the late, great, John Taylor, who taught me while I was at the University of York. While she died when I was relatively young, she was an enormously inspiring musical presence in my life, and so it was with John; and almost by proxy, Kenny Wheeler, whose music John championed at York. My mum, John, Kenny, and Keith and Julie Tippetts – who gave me my very first experiences of jazz and free improvisation at the Dartington International Summer School, when I was only eight – all these elders, mentors, guides, inspirational musicians gave me the gift of music, and of loving it, and of being able to be healed by it, allowing me to experience musical joys that will stay with me forever. Again, they are all fundamental to my own personal story, and therefore an exploration of what they represent to me, and indeed their music, absolutely had to be part of this album! This is why you hear two of John's pieces, and one of Kenny's – Kind Folk is my all-time favourite tune! – but they also help to tell the overall narrative of the album; that, through and after childhood, and in and around difficult, painful experiences, it is these 'Kind Folk', these mentors and guides, who give you the gift of support, love and compassion, which for me was embodied by their musical offerings. LJN: And the people who help you make this music – The Dissolute Society? 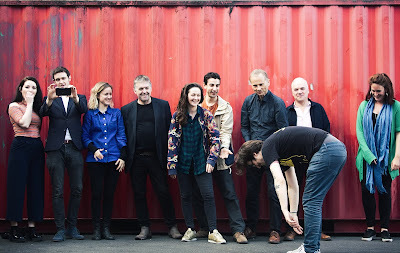 RC: The band line-up is no coincidence... it is full of 'Kind Folk', many of whom connect to the narratives and themes of the album. Phil Merriman and Simon Roth form a rhythm section partnership forged long ago at York; theirs is a special musical bond, and I love making music with them. One of my biggest musical regrets is not making more music with my mum; and so it is my great joy to make music with my dad (Gustav Clarkson), who plays viola on this album. He's joined in the strings by my partner Zosia Jagodzinska on cello, whom I've known since the age of 16, and who brings a unique way of improvising to the ensemble, drawing on her love of 20th Century classical music, along with Naomi Burrell, herself a baroque violinist (amongst many other styles). Their distinctive, cross-genre creative approach represents a drawing together of my interests in jazz and groove-based music, and the western classical music history that is so deeply connected to my mother and my European background. I've always loved Laura Jurd's playing, and again, her strong connection to British jazz and its history, as well as her distinctive, almost folkloric sound, seemed a natural and exciting fit for this ensemble. I met Laura playing in some of her earlier large ensemble projects, and I sat next to Mike Soper, and knew that I'd love to make more music with him. Laura and Mike's trumpet duet in the final track is an album highlight for me and in some ways feels like things coming full circle. Fini Bearman is one person that I didn't know well before putting the band together, but as soon as we tried stuff out, I knew she was an utterly perfect fit. There is such a rich, varied range of vocal approaches in her performance on this album, and she committed herself to telling essentially my personal stories, my words, with such passion and care. Indeed, words dominate this album and tie the narrative threads together across quite a variety of musical approaches; so, I wanted to have a range of voices heard, as well as mine and Fini's – so, the incredible Mia Marlen Berg's vocal fireworks feature, as do Joshua Idehen's fiery original words in response to/within my tune Find the Way Through. John Taylor was originally going to guest on this record, before his untimely passing; Huw Warren, whose style and approach bear so many connections to John's, joined The Dissolute Society to pay tribute to John quite beautifully at one of our earliest gigs; and it made complete sense, after that, to dedicate the album to John and have Huw as our guest pianist for the record. And I should also mention Liran Donin, the producer of the album; it was his encouragement that led me to commit to making the record in the first place. We first started talking about making it when he saw me working on 'Grandma', and we discovered our shared jewish heritage. Thereafter he embodied all the wonderful qualities in the elders, mentors and musicians around me in the ensemble, that I wanted to celebrate on the album. LJN: Great band name – where did that come from? And why did you choose it? RC: One of the earliest iterations of The Dissolute Society was a sort of early-music/folk/contemporary jazz crossover ensemble I put together. One piece we played was Heinrich Biber's Battaglia, written in 1673. This is a suite of pieces for strings that represents battle and its surrounding experiences; one movement of the piece describes a group of drunk soldiers marching home, each singing a separate song in a different key, such that in combination they clash chaotically. This movement is called Die liederliche Gesellschaft von allerley Humor, or, The Dissolute Society of all sorts. It is well worth hearing – remarkable that something so dissonant and progressive was written in 1673! That idea of organised chaos, of a fragmented, loose and yet connected group, band or 'society', really appeals to me; for me, it gets to the heart of the sort of joyously unbridled improv set against groove and insistent rhythm and ostinato, that you hear in legendary bands like those led by Mingus, or Loose Tubes, or the Brotherhood of Breath. Also, coming from a piece (and a way of using the piece) that suggests cross-genre approaches, and links between different periods of musical history, the band title seems like a perfect frame within which to explore the disparate styles that we do. LJN: And what does the music sound like? What are its stylistic sources? RC: Given the personal narrative of the album, it seemed to make sense to me to celebrate all the musical things that I love and bring me joy! So as well as the contemporary European jazz of John Taylor and Kenny Wheeler, there is a nod to 20th century classical music writing and sounds; Fini's sprechstimme, or 'spoken singing' as exemplified by Arnold Schönberg, is a good example of that at many points of the album, and I suppose the work of Bartok, Stravinsky, Berio and Kurtag is there in the background somewhere; at the heart of the album there is an improvised version of a Hungarian folksong used by Bartok in one of his piano pieces. I also absolutely love the joy and passion of gospel-jazz grooves and harmony (Marvin Sapp, Kirk Franklin as well as Jill Scott, Take 6, and indeed the gospel chops of band member Phil Merriman), and these sounds are hinted at at points throughout the album; it is this sound world that draws the album to a close, narratively pointing towards a hopeful future. There is of course a variety of freely improvised musical approaches that help to tie together these elements and the many words that run through the album; these are heavily inspired by the work of Keith and Julie Tippetts. LJN: The album deals with some difficult subjects. Was it hard to write? And, in some sense, did writing it help you to deal with the difficulty of the subject matter? RC: Surprisingly perhaps, I don't think it was hard to write; not in the sense of emotionally hard or painful. This inner-world had been swirling and looking for expression for a long time, and a lot of it came out very quickly; the difficult part was working out how to put all the pieces together in a way that made sense to me. Again, discussing these subjects felt (and feels) like the most authentic creative thing that I can offer as an artist, and once I realised that, all these thoughts, experiences, emotions, had an outlet with a clear sense of purpose. So in that sense, yes, writing the album helped me to deal with the subject matter – making this has certainly been cathartic. Although of course, once you share it with the world, you do expose these vulnerable parts of the self to the world; for me, doing that, and performing the music, is much harder than the creating (although, ultimately no less rewarding). LJN: Where can we hear the band in performance?